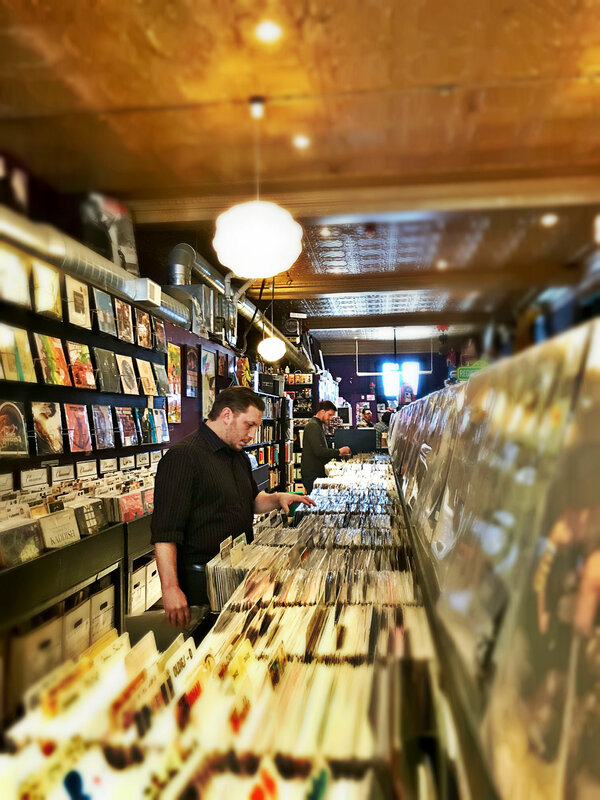 April 21 is Record Store Day, an annual declaration of recognition and love for independently-owned record shops and the artists they feature. The event is billed as a day for the people who make up the world of the record store—the staff, the customers, and the artists—to come together and celebrate the unique culture of these stores and the special role they play in their communities. Launched in 2008, the event now encompasses 1400 stores in the US and thousands of similar stores internationally—on every continent except Antarctica. Luckily for the Ferndale community, it isn't necessary to look to such far-flung locales for quality vinyl. 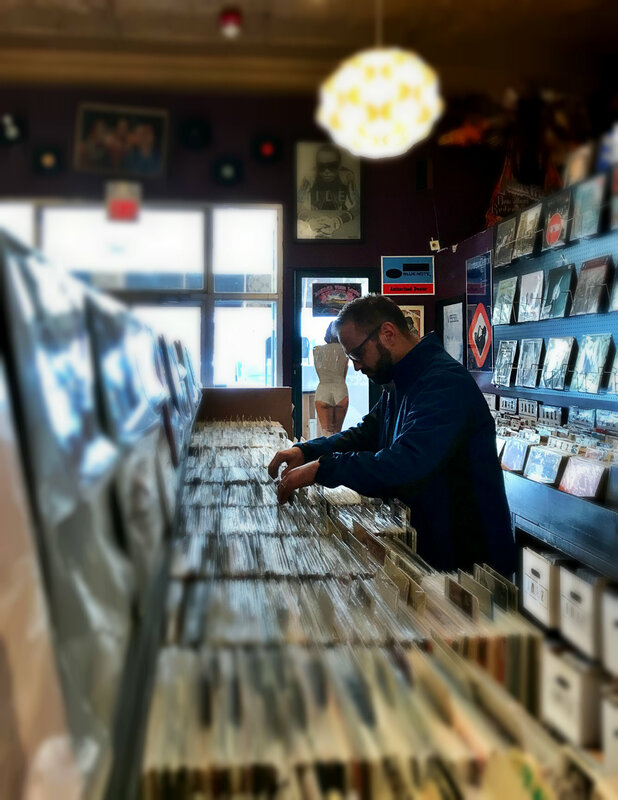 Since 2012, Downtown Ferndale's own Found Sound has been serving up records (and tapes, discs, and more)—a thoughtfully curated selection ranging from mainstream rock to eccentric indie and everything in between—by a staff who have been hailed as "deeply knowledgeable and genuinely friendly" and "the best in the Mitten." It's clear that Found Sound has scores of dedicated fans and followers . . . and you'll find several of them here at the City of Ferndale. 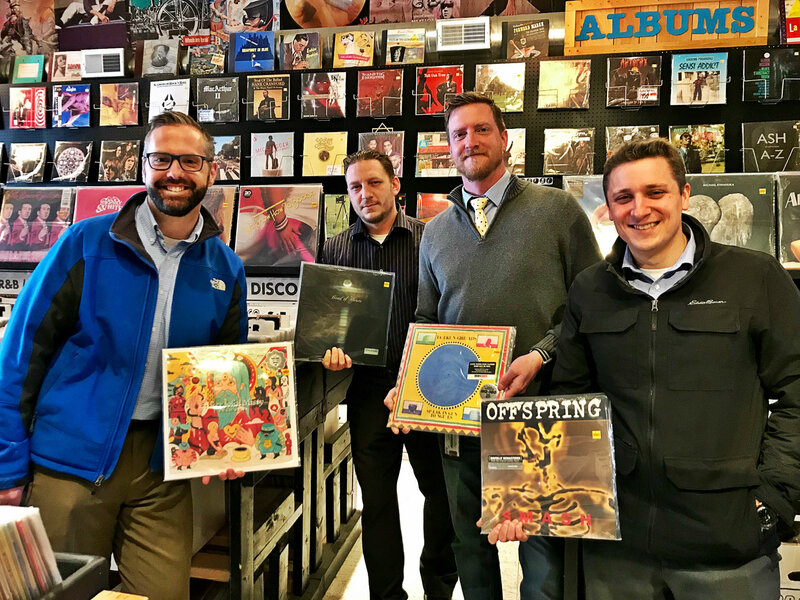 Assistant City Manager Joe Gacioch, Human Resources Coordinator Justin Giorlando, Community and Economic Development (CED) Inspector Adam Loomis, and CED Director Jordan Twardy are a few of City Hall's vinylphiles. 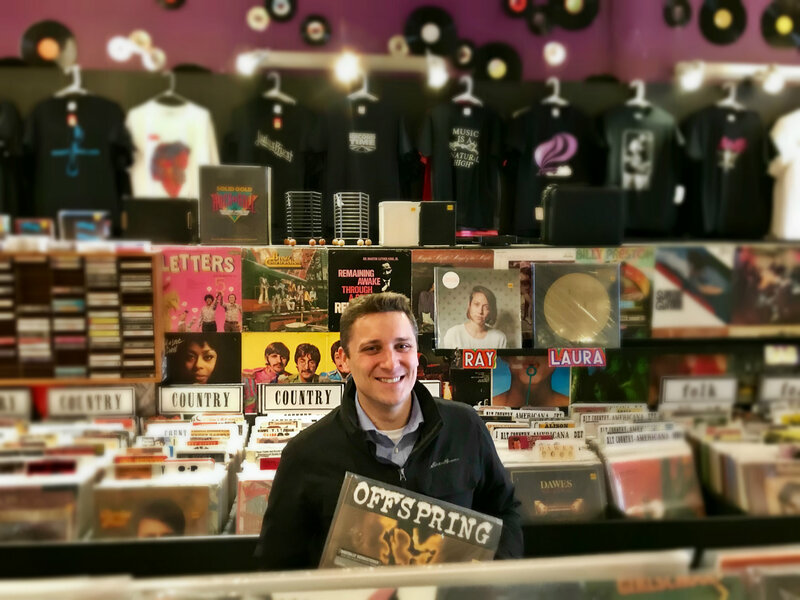 In honor of Record Store Day, they headed to Found Sound to thumb through the store's bins and add a few new albums to their collections. Joe, Justin, Adam, and Jordan shop to the overhead tunes of Jim Croce's Bad Bad Leroy Brown and Rush's Fly By Night. Justin's favorite album of all time? "That's an impossible choice, man. But a couple of the great ones: Nirvana's Nevermind and The Beatles' The White Album." "Vinyl is just a good way to listen to good music. The perception is warmer. With digital, the signals are more compressed; you don't experience that full dynamic, the richness. Vinyl is more . . . fulfilling. There's also a certain amount of nostalgia." Jordan's first-ever album was Aerosmith's Angel. "My favorite album changes constantly—every day. But I think my first-ever album was The Bangles' Walk Like an Egyptian. Yeah, I walked like an Egyptian." 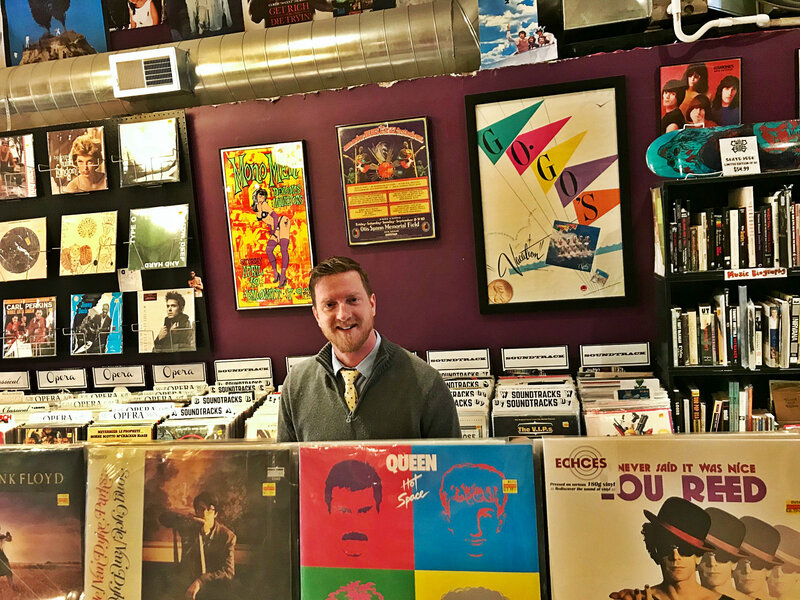 According to Found Sound's creative founder Ray Hayosh (a perennial customer favorite for his encyclopedic knowledge and friendly assistance), the store will be holding an all-day celebration for Record Store Day. They'll have raffles, prizes, and free events, including live performances by Sisters of Your Sunshine Vapor, Brother Son, The Idiot Kids, Troy Gregory, The Stools, and more. Check them out in person this weekend, or see their Record Store Day Facebook event for more information.